I love playing the This or That game with kids, you know, the game where you offer up two choices and ask them which their favorite is. It’s so fun to see them think through the two options – popcorn or strawberries? winter or summer? the slide or a swing? – you get my drift. So a few weeks ago I sat at Red Robin, across from my 4 year old niece Scarlett, and we played this game. C: Would you rather have pizza or hamburgers? C: Which do you like best, pink or blue? C: Would you rather ride a horse or a dolphin? C: Do you like cats better or dogs? S: How’s Cali? What do you think she’s doing right now? C: She’s probably sleeping. Her leg has been hurting her lately so I bet she’s resting it. S: How about we just pray about that right now? folds hands, bows head Dear God, please make Cali’s leg feel better and for her to be all better. Amen. See? You just gotta pray about it. C: speechless …. You’re right! Thanks for praying for her! I am so glad that God hears all of our prayers, aren’t you? S: Oh yes. Hey, can I get some ranch? Just like that our prayer moment was over. I have to be honest, the whole response went so fast I am not even sure if I managed to get my eyes closed or my hands folded before we were on to the next subject, but the moment has lingered in my heart. 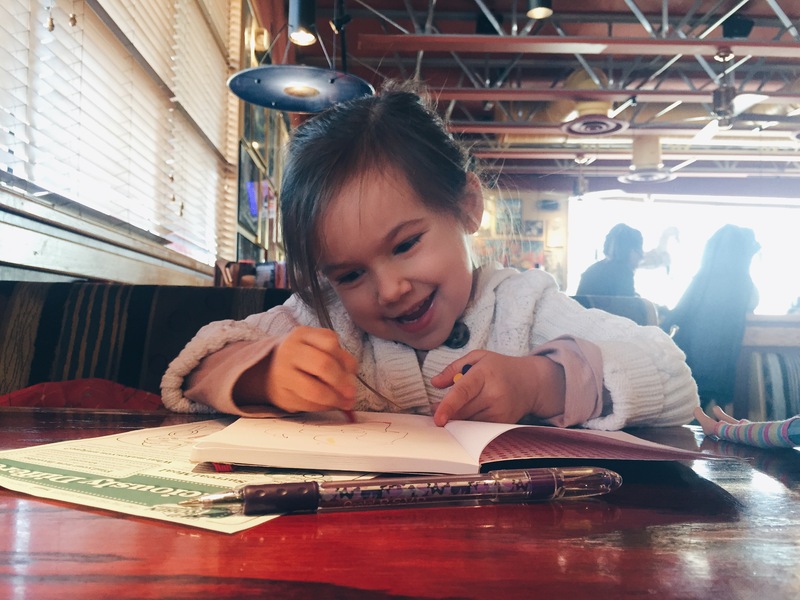 What is it about that simple, childlike faith that makes prayer seem SO natural, a first response, a simple breath of words shot straight up to God’s ears? 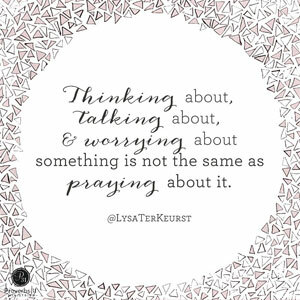 If you’re anything like me, it can sure be a lot easier to talk about our problems instead of praying about our struggles. I have spent a lot more time telling people about how I am worried about Cali’s arthritic leg than I have talking to my Father about my worries about her leg. Sometimes it just is easier to complain about our struggles then to pray about them. Or I do ask. Once, maybe twice. In all honesty, sometimes it can be so hard for me to continue to pray the same prayer every day – Lord, please, I am begging you, answer our prayers for a family. Let this cycle work. Provide us with the child that our hearts long for. Next day, repeat. Next month, repeat. Next year, repeat. My prayers seem a lot more weary then they used to be and it’s become easier to write about my struggles, talk about my struggles, process my struggles over coffee (or wine) … but it can often seem redundant to keep repeating my struggles in prayer. But why is that? Scarlett taught me the simplicity of a simple prayer that day over hamburger buns and ranch. How about we just pray about that right now? When our hearts are aching or we feel the weight of someone in our minds, why don’t we just pray about that right now? The beauty of prayer is that it doesn’t need to be complex! It doesn’t need to follow a specific formula, it just needs to be genuine and brought to His feet. There are times I have no words left to pray. Those are the days I just need to whisper up Lord, help. I don’t know about you but I want to read these verses over and over and over again. I am so thankful that the Holy Spirit does our praying for us when we simply can’t anymore. And I am thankful for others who lift up prayers for us on our behalf. But I also need to remember that my tendency to ‘talk about it more than I pray about it’ has to be worked on too. There will be a lot of one line breath prayers reaching heaven’s gate from my mouth. I don’t ever want to be caught talking about something more than I know I am praying about something. I don’t want to waste any more of my life asking for answers without going to HIM for those answers. Help me friends. Let’s keep one another accountable to putting our hope in Him, not in our circumstances, and doing that by bringing Him our lives in prayer. I know this is an area I certainly need to work on. friday favorites – march 6. Amen, amen, amen. Thank you so much for this post and the authenticity you bring to your writing. Reading new posts from you is one of the highlights of my day and always leave me with something to chew on and a challenge to accept, which I do happily. I will definitely be joining you in prayer! Thank you for your encouragement and words! I am touched to know that you look forward to reading my posts. :) I appreciate your prayers and am sending you hugs for a great weekend! Wow. What an incredible translation of that verse! Thank you for sharing that. SO GOOD RIGHT!? I couldn’t get enough of it! So glad you were blessed by His words too. They really are! I am thankful to have so many in my life teaching me how to look for Him and at Him in the simplest ways. XO! Beautiful…I find myself doing the exact same thing. Probably, because I want someone to answer me back in a voice that I can audibly hear. I need to learn to take it to Him more! Oh I have pleaded for an audible voice so many times. And then I read His word and realize its about as audible as it can get. I am praying for you today friend! Oh for us to try to be like children…it would myself, I know, a world of good!! Wouldn’t it? As long as we could keep the toy stealing to a minimum, hehe! :) Happy Friday! that message translation is so, so good. and thank you for the reminder to just pray, dang it. thank you. may the Lord bless you. Wasn’t that a great translation? I loved it so much! Praying that you are reminded today that He is there and that the Lord blesses you today too! Hugs! So glad you were blessed by this reminder today! xoxo! Girl. that verse is just so so so good. I LOVE that translation. It always brings so much hope to my heart and I love that you posted about it! So good! I am so glad you were blessed by His words today too. I love diving into different translations and seeing what He has to teach me that day. Love you friend! Beautiful post, Chelsea. What a wonderful interaction with your niece. It’s funny what kids can teach us. Thank youuuuu!!! Loved that verse too!!!! So when we’re ‘expecting’ His promises, we must care for ourselves as though we’re an expectant mother – feeding ourselves with His Word and promises and listening to our bodies (Holy Spirit) and our heavenly doctor. We mustn’t tread or linger in harmful, unhealthy places. Such a great analogy – thanks for that!!!! Love fresh revelation!!! !